Five persons, including a policeman, were injured in Bhilwara town in a clash between VHP activists enforcing a bandh and members of a minority community, prompting authorities to impose curfew. BJP and Bajrang Dal activists squat on the railway track in Bikaner during the Rajasthan bandh on Thursday. While the investigating team is still looking for substantive leads to unravel the terrorist attack it has now been confirmed that a third driver, Yunus, is also being interrogated by the police. 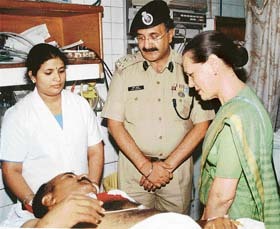 Congress President Sonia Gandhi talks to a CRPF jawan, injured during the terrorist attack in Ayodhya, at AIIMS in New Delhi, on Thursday. A meeting of the Cabinet Committee on Political Affairs today reviewed the possible political and security fallout following Tuesday’s terrorist attack on the Ram Janmabhoomi-Babri Masjid complex in Ayodhya. The day-long bandh called by the Vishwa Hindu Parishad in Maharashtra today to protest against the terror attack at Ayodhya on Tuesday had no effect on life in the state barring minor incidents of violence, the police said. Forty-year-old Shanti Devi, who has been in deep coma after suffering head injuries during the flushing out of terrorists in Ayodhya on Tuesday, is being referred to the Super Speciality Sanjay Gandhi Post Graduate Institute of Medical Sciences as she requires ventilator and complete life support system. Overcoming his earlier reluctance, BJP president L.K. Advani today decided to reach Ayodhya tomorrow, in an obvious attempt to build a national movement around the terrorist attack on the Ram Janmabhoomi-Babri Masjid complex. A Delhi court today allowed the Chandigarh Police to take Babbar Khalsa chief Jagtar Singh Hawara, arrested by the Delhi police in connection with the May 22 cinema halls blasts in the capital, to Chandigarh where he is wanted in connection with the assassination of former Punjab Chief Minister Beant Singh and the Burail jail break case. Flood situation in Himachal Pradesh and Madhya Pradesh continued to be serious with heavy rain continuing even as life limped back to normal in Gujarat where survey for the assessment of the damage caused by floods had already begun. The Shiv Sena in Maharashtra paraded 51 MLAs before the Speaker of the state Assembly, Babasaheb Kupekar, in a formal show of strength today. Suspected Maoists struck terror in villages in Orissa’s Sambalpur district, brutally killing five persons in the wee hours today, just over a month after they shot dead three persons. Mrs Pratibha Patil, Governor of Rajasthan, issued warrants of appointment yesterday to instal Mr Justice N.K. Jain, as Chairman of Rajasthan State Human Rights Commission. Indian Idol runner up Amit Sana records his debut film song. Curfew was imposed and security beefed up in the communally sensitive areas of the town after pro-bandh demonstrators and the minority group clashed and pelted stones at each other in the Gulmandi locality, Suprintendent of Police, Bhilwara, Govind Gupta said. Five persons were injured and several vehicles damaged in the melee, the official said, adding that the curfew was imposed to avert similar ugly incidents. Gupta said the trouble began when a pro-bandh demonstrator was attacked with a sharp-edged weapon as he tried to force a shopkeeper to down his shutters during the bandh called in protest against the terror attack in Ayodhya. Senior administration and police officials, including the District Collector, were camping the area to ensure law and order, he said. Barring a few minor stray incidents the VHP-sponsored bandh was peaceful throughout Rajasthan with shops, business establishments and educational institutions remaining closed, Additional Director General of Police (Law and Order) Kanihyalal said. Similar incidents of stone pelting between VHP-BJP activists and minority community groups over closure of shops were also reported from Pali and Sikar, where two persons were injured, the police said. Security has beefed up in both places with deployment of additional forces to prevent any further untoward incidents, the sources said. Train services were disrupted for some time when bandh activists stopped the Frontier Mail at Bharatpur, Bina-Baran Express at Baran and a few passenger trains at Bikaner, a Railway spokesman said. Bus services were affected in Jodhpur, Ajmer and Swai Madhopur during the bandh for sometime as demonstrators broke the glass panes of the vehicles. The police said that barring Hanumangarh the bandh was felt in other cities as educational institutes, shops and other establishments closed down. 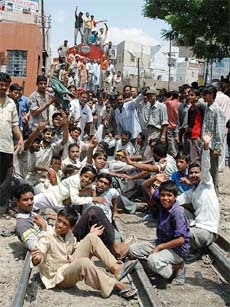 However, the bandh had no impact on government offices which functioned normally, police said. According to police sources, Yunus was the junior driver and worked as an assistant to Raj Kumar, who had brought the terrorists from neighboring district of Akbarpur to Faizabad on Tuesday morning by a Mahindra jeep run as a shared cab. Yunus also occasionally drove the vehicle inside Akbarpur city. It was he who had picked the terrorists on the fateful day at 5.30 am from Tiraha tehsil in Akbarpur, one-and-a-half km away from the city’s railway station. The terrorists had booked the cab for Rs 400 and wanted to be taken to Faizabad, 56 km away. On way Yunus stopped at Raj Kumar’s house to pick his senior colleague, as he never used to drive alone on long routes. When Yunus got down to talk to Raj Kumar, one of the terrorists, now believed to be their leader, became suspicious and quickly got off to find out what the driver was up to. When Yunus told him that Raj Kumar will now drive the jeep and he will sit with him in the front seat, the leader flatly refused. He did not even permit Yunus to sit in the back seat. So Yunus was left behind and Raj Kumar drove militants to Faizabad. He covered the 56 km in 2 hours and dropped them 7.30 am near the bus stop. It was here that they hired Rehan’s jeep that they later blasted. After dropping the terrorists Raj Kumar immediately returned to Akbarpur. Later in the day he revisited Faizabad with more passengers. Yunus, as usual was sitting beside him. By then the Faizabad police was already on the look out for his vehicle as Rehan after being picked up from the site had provided the vehicle’s registration number. The police picked both Raj Kumar and assistant, Yunus, late on Tuesday evening. For the past two days they are being grilled to collect more information about the militants. The Akbarpur drivers were even taken back by the police to retrace the sequence of events. Meanwhile, Home Secretary, Alok Sinha said it was too early to guess about the identity of the terrorists. “Whatever is appearing in the media regarding their identity is speculative assessments often by officials not authorised to speak”. The bodies of the six unidentified men killed during the operation were disposed off as per their religions early Wednesday morning, confirmed Mr Sinha. This was done immediately after the post-mortem and documentation of their identification marks. Additional Director General of PAC Bua Singh announced on Thursday that the name of seven PAC personnel who showed “exemplary courage in the operation and had been recommended for out of turn promotions”. They are Company Cdr Krishan Narain Sen, Platoon Cdr Naresh Singh Yadav, Head constables Ramakant Yadav and Musharraf Ali and constables Inderjeet Prasad, Himanshu Yadav and Shatrughan Dwevedi. A meeting of the Cabinet Committee on Political Affairs (CCPA) today reviewed the possible political and security fallout following Tuesday’s terrorist attack on the Ram Janmabhoomi-Babri Masjid complex in Ayodhya. The late night meeting, chaired by Defence Minister Pranab Mukherjee, reviewed the situation, particularly in view of the main opposition party BJP and the Sangh Parivar trying to “politicise” the issue and the proposed visit of Leader of the Opposition L K Advani to Ayodhya tomorrow. The meeting, attended among others by Home Minister Shivraj Patil, External Affairs Minister Natwar Singh and Civil Aviation Minister Praful Patel, focussed mainly around the measures to be initiated to check any possible communal flare-up in the country in the wake of the countrywide protests planned by the BJP and Sangh Parivar outfits. Incidentally, Congress President Sonia Gandhi is also not in the capital and is away on a three-day visit to her constituency, Rai Bareily in Uttar Pradesh. She is expected to return only on July 9. Emerging out of the meeting, Mr Patil said the government had “some information” about the identity of the terrorists involved in the Ayodhya attack. “We have some information but we would like to give this information only after getting all information which is more important to pin them (terrorists) down,” Mr Patil said to a question on whether the identity of the terrorist group involved in Tuesday’s attack had been established. In an apparent reference to the storming of the Indore airport by the VHP-BJP activists yesterday, Mr Patil said airports, railway stations and such places should not be targeted as this was not in the interest of the country. He also said that the Centre would certainly help the governments of Uttar Pradesh and other states to see that adequate security was provided to vital installations and other important places. Earlier in the day at the stone-laying ceremony of the new campus of the IDSA, the Defence Minister observed that India was facing challenges both externally and internally and the Ayodhya attack was one such incident which depicted the complexity of the challenges the country faces. “We have a number of challenges, both internally and externally that needed to be addressed in an astute and calibrated manner,” Mr Mukherjee said. The day-long bandh called by the Vishwa Hindu Parishad (VHP) in Maharashtra today to protest against the terror attack at Ayodhya on Tuesday had no effect on life in the state barring minor incidents of violence, the police said. Attempts by VHP cadres to disrupt public transport failed in the town of Nagpur where a few state transport corporation buses were damaged. Elsewhere similar attempts were foiled by the heavy security presence across the state. VHP had exempted Mumbai from the bandh after the Shiv Sena decided not to participate in it. The Bharatiya Janata Party also announced that it would not be participating in the bandh. Both the Shiv Sena and the BJP have been fined Rs 20 lakh each by the Bombay High Court for calling a bandh two years ago after bombs went off in a BEST bus in Mumbai. In Mumbai, the VHP zonal secretary Venkatesh Abdev said Mumbai was exempted from the bandh after an appeal by eminent citizens. “We did not enforce the bandh in Mumbai because we are told that the losses caused by the bandh were just too much,” Abdev said. In some parts of Vidarbha, schools and colleges remained shut due to non-availability of school bus services. Forty-year-old Shanti Devi, who has been in deep coma after suffering head injuries during the flushing out of terrorists in Ayodhya on Tuesday, is being referred to the Super Speciality Sanjay Gandhi Post Graduate Institute of Medical Sciences (SGPGIMS) as she requires ventilator and complete life support system. Neuro surgeon Ravi Dev, who is treating her at the King George Medical University Trauma Centre said, “She suffered serious head injury with multiple contusion and her GS less than 7. Such patients have very slim chances of survival. Her cat scan shows no foreign body that can be removed surgically”. The decision to shift her to SGPGIMS has been taken by a panel of doctors as a precautionary measure, Dr Dev said. With swollen face and heavily-bandaged head, Shanta Devi lies in the neuro ward of the trauma centre. With nurses not visible anywhere four relatives are attending her round the clock. Shanti Devi’s 22-year-old daughter Kaushalaya and son-in-law Laxman Yadav have rushed from Gonda to look after her. Her husband Ram Chander Yadav and nephew Hanuman Prasad are also around. A resident of Ramkot Katara, the densely-populated locality adjoining the rear end of the Ramjanambhoomi complex, she was washing clothes at a hand pump near her house when the terror struck. While one version is that a splinter from the blasted jeep hit her, another version is that before she could realise she was hit by the armed terrorist running towards her locality who finally scaled a wall and entered the complex not far from her house. Mr Advani, also sought to justify his decision by countering Prime Minister Manmohan Singh’s charge that the Sangh Parivar was indulging in “cheap politics” over the Ayodhya attack. Though Ms Swaraj refuted media reports that Mr Advani was to visit Ayodhya yesterday itself, but was hesitant as he did not want to “complicate the situation for UP chief Minister Mulayam Singh Yadav”, sources in the party said the party chief was a bit sceptical about people’s response and wanted the party’s agitational programmes to pick up before he visited Ayodhya. Sources also said that Mr Mulayam Singh Yadav had through NDA convener George Fernandes urged Mr Advani not to “aggravate the situation”. Mr Advani also asserted that the Allahabad HC’s order against discharging him from the Babri Masjid demolition case will not have any “adverse effects” on the BJP. The Lucknow Bench of the Allahabad High Court had yesterday set aside the order of the Rae Bareli court, discharging Mr Advani from the Babri demolition case. The revision petitions filed by other BJP leaders, Murli Manohar Joshi and Uma Bharti, and VHP leaders Ashok Singhal and Acharya Giriraj Kishore against whom charges have been framed were also dismissed by the High Court. Meanwhile, the BJP today said that the Allahabad High Court order might be challenged in the Supreme Court. In the wake of the attack in Ayodhya by terrorists, Lok Sabha Speaker Somnath Chatterjee today reviewed the security arrangements in and around Parliament House. He called a meeting of senior officers of the Lok Sabha secretariat and gave directions to tighten the security arrangements. Allowing a transit remand plea, Additional Chief Metropolitan Magistrate Madhu Jain ordered the Chandigarh police to produce the accused before a local court there tomorrow for obtaining a regular remand. Ms Jain further directed the Chandigarh police to bring Hawara back to the Capital on July 11 for appearing in connection with the blasts. Meanwhile, the court refused to hand over Hawara to the Ropar police which had come to the capital with a production warrant issued by a local court there in connection with a blast case. Hawara, who is a proclaimed offender in the Beant Singh assassination case, was arrested by the Delhi police along with Jaspal, the alleged mastermind behind the twin blasts in the capital, and his accomplice Vikas Sehgal on June 8. While Hawara was sent to Chandigarh on a transit remand, the other two were remanded to judicial custody till July 21. The toll in the floods in the three states had touched 239 with as many as 37 persons losing their lives so far in Madhya Pradesh and another 15 still missing, an official spokesman said here today after a high-level review meeting. About 12 lakh people, majority from urban areas, had been affected by the floods which had disrupted telecommunication and road links. In Himachal Pradesh, loss and damage to public and private property is estimated to be about Rs 100 crore, he added. Heavy to very heavy rains had been reported in Shimla, Kinnaur, Kulu, Bilaspur, Solan and Mandi districts and the Ravi and the Beas are flowing above danger mark and the water level is rising. The tributaries of the Pabbar river in Shimla district and Baspa in Kinnaur district were in spate, while the Sutlej is flowing below warning level, the spokesman said adding that no of loss of life had been reported so far. The National Highway No 21 and 22 and state highways are blocked and steps are being taken to repair or even restore the traffic. About 10,000 people are affected in the floods so far and 10 bighas of orchard, 13 wooden bridges and one forest rest house have been washed away, he said. Four Army columns and 15 motor boats had been deployed in Panna, Sagar, Damoh districts of Madhya Pradesh to rescue people, he said adding that four helicopters had also been deployed for relief operations in Damoh and Panna. In Gujarat, he said, so far 202 people had died due to collapse of houses and in lightning with another 11 still missing. The spokesman said 20 out of the 25 districts in Gujarat had been hit by the incessant rains and nearly 2.98 lakh people had been evacuated to safer places. As many as 39 dams were still on “high alert”, 14 on “alert” and 16 were above the danger mark, he said, adding that the state received an average rainfall of 863 mm. Air, road and rail traffic was restored in the state though power and water supply continued to be affected in some villages, he said. The IAF, Army and para-military forces continued rescue and relief operations in the state. The MLAs were brought in special buses in the morning and taken to the Speaker’s chamber. Kupekar told Shiv Sena leaders that he wanted to speak to the MLAs individually. The MLAs were escorted to the Assembly complex by Ramdas Kadam, who was elected Leader of the Shiv Sena legislative party yesterday. The Speaker’s decision is still awaited. However, dissident Shiv Sena leader Narayan Rane indicated that 22 of the 63 party MLAs were with him. Speaking in the chamber of the Leader of the Opposition, Mr Rane told reporters that a clear picture would emerge tomorrow during the party meeting summoned by chief whip Vinayak Nimhan appointed by him. Mr Rane warned that MLAs staying away from tomorrow’s meeting would face disqualification. The Shiv Sena has now hit out at the Speaker for accepting Nimhan as the Shiv Sena’s chief whip. “The Speaker was putting the Shiv Sena into difficulties,” Mr Bal Thackeray told party mouthpiece Saamna today. Meanwhile, the BJP broke its silence on the issue and extended support to the Thackeray family. “We hope that the strength of the Shiv Sena remains 62 after Rane’s expulsion from the party,” BJP General Secretary Pramod Mahajan said here. He, however, did not comment on reports that the BJP would stake claim for the post of the Leader of the Opposition if the Shiv Sena’s tally in the house fell below the BJP’s 54 MLAs. The heavily armed ultras, numbering about 30, moved from one village to another for several hours, called out people selectively and axed them to death, police said. The ultras might have killed the five villagers suspecting them to be police informers, the police said. The DIG of police (northern range) Pranabindu Acharya and the Superintendent of Police Sushanta Kumar Nath have rushed to the area. The sources said those killed were Gurucharan Nayak, the husband of a panchayat member, who was done to death with a crowbar in Tamparsinga village. Three others, Janam Majhi (35), Deshi Mirdha (35) and Iswar Majhi (40) were hacked to death at neighbouring Banjaritikira hamlet while Surubabu Podha (48), a teacher, was killed at Larabira village. Mrs Pratibha Patil, Governor of Rajasthan, issued warrants of appointment yesterday to instal Mr Justice N.K. Jain, as Chairman of Rajasthan State Human Rights Commission (RSHRC). Mr Jain is currently chief of the Human Rights Commission and Lokayukt of Himachal Pradesh. Besides Mr Jain, a former Law Secretary of the state government, Mr Jagat Singh and recently retired IAS officer Dharm Singh Meena have also been appointed as members of the RSHRC. Interestingly, had these appointments not been made yesterday, the RSHRC would have become virtually bereft of any constitutional authority, as the only member and officiating chairman, Mr Amar Singh Godhara, was to retire the same evening. For several months, the RSHRC had been functioning only with one member who also officiated as chairman of this august body.